The 9 KPIs that we focus on measure "overall performance," above and across the details of individual investments and cost centers. 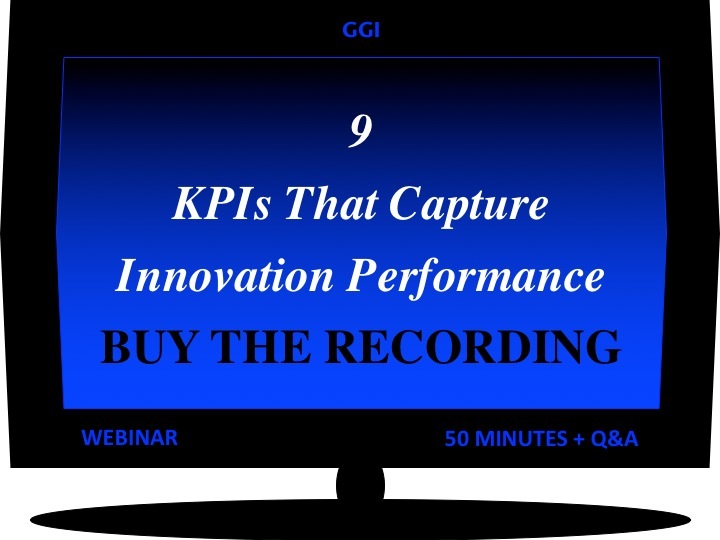 These 9 KPIs are all strong candidates for innovation leader and manager dashboards. These 9 KPIs positively facilitate, and then come close to capturing, the business and financial performance of investments in R&D and product development. With these 9 KPIs, you'll have a pretty good handle on your corporate innovation performance. For those metrics that you recognize from the list below, we will likely expand your knowledge of the metric and its benefits and drawbacks. For those metrics you do not recognize, we hope to introduce you to some useful performance indicators you may not yet be aware of. These demo recordings of recent webinars and courses give viewers an idea of the subject matter by sharing the cover and table of contents of the document used in the program. You’ll see how we set the stage as we begin. You’ll get an idea of how we package the full-length recording, and the music we add, in 4 minutes. Some folks say that our numerous complete bibliographic references, with the URLs, of the sources we cite, saves them hours surfing the web to find accurate and reliable information. Check out the demo. Get the full length version. Just find the TV screen at the bottom of this page and it will bring you to the GGiSTORE. Which 2 KPIs were New-To-The-World in 2015? Which 2 KPIs were New-To-The-World in 2012? Which 2 KPIs are the fastest KPIs to penetrate industry in the past five decades? Which KPI is New-To-The-World and uses R&D Spending % to predict innovation performance? 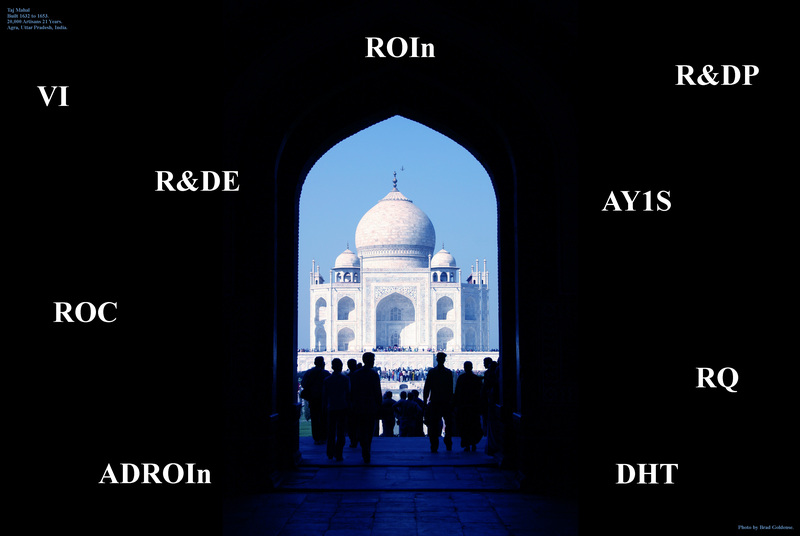 Which KPI ties your research and advanced development expenditures to your revenues and profits? Which KPI was recently made public for all to use by a large international high-tech company? Which KPI is currently the de-facto standard for assessing absolute levels of innovation? Which KPI has the highest correlation with corporation value and shareholder return? This is an exciting time for KPIs. We'll give a brief mention of the tussle that is building between the accounting profession, the SEC, and the folks responsible for corporate annual reporting regarding your favorite KPIs. Brad Goldense has been focusing on the strategies, tactics, and operations of product management, development, and manufacturing since the 1980s. He has authored over 300 publications and consulted to over 200 companies across the world. Some 500 companies have participated in his seminars and masterclasses. Mr. Goldense holds a BSCE from Brown University and an MBA from Cornell University; along with professional accreditations in new product development, engineering, manufacturing engineering, production and inventory management, and computing. Brad taught in the Executive Masters in Engineering Management program at the Gordon Institute of Tufts University for nineteen years. He has appeared on World Business Review, CNBC, and PBS. GGI has been a pioneer of improved metrics and KPIs for product development organizations and technologies dating back to the 1980s, what we now refer to as "innovation." GGI has systematically researched industry usage of these metrics for years. As well, we've contributed to industry adoption of some great metrics such as the Vitality Index and ROInnovation, the two fastest penetrating metrics of the past five decades. Enhance your ability to truly capture overall innovation performance.